Standards and standardization policies increasingly influence innovation and competitiveness. As well as examining how standards are developed and applied, this important new book considers whether technical standards function as effective public policy instruments and components in the processes of industrial globalization. Much of the existing literature in the field makes reference either to information and communication technologies or to the protection and management of the natural environment. 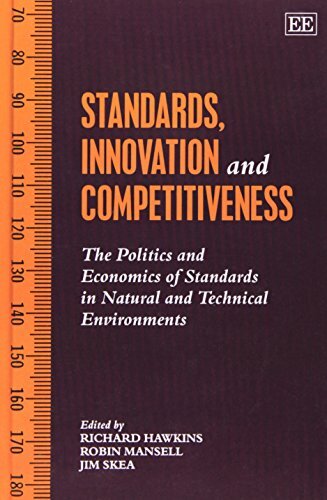 In Standards, Innovation and Competitiveness there is a recognition of how closely integrated both sectors have become over questions of process, the role of scientific assessment, and the `network' effects that accompany standardization. The contributors shift the research and policy focus away from narrowly defined sectoral concerns, towards a more generic view of standards and standards-setting, and their roles as instruments of public policy. With nineteen papers by authors from seven countries, the blend of approaches ranges from formal economic analysis, through political, sociological, and historical analysis, to pragmatic discussions by standards makers themselves. The subjects discussed include issue definition, methodological approaches, political articulation of public and private sector agendas, organizational and decision-making processes, the role of technology users in standardization, and the relationship between standardization and innovation.